Pop those wine corks...and create a large wine cork bulletin board. Our wine cork kits are one of our most popular products, since half the fun is in the making! The large bulletin board made in mahogany wood is perfect for the kitchen, home office, or wine cellar. We supply the mahogany frame and instructions. You supply the wine corks. Pop those wine corks...and create a large wine cork bulletin board. Our wine cork kits are one of our most popular products, since half the fun is in the making! The large bulletin board made in mahogany wood is perfect for the kitchen, home office, or wine cellar. We supply the mahogany frame and instructions. You supply the wine corks. Gift boxed. Approximately 256 wine corks are required to complete bulletin board kit. Note: Wine corks vary in size. BEST ANSWER: It must be about 1" to 1-1/8" deep as the 'champagne' corks I lined around the outside fit in nearly perfectly. I believe (from sitting here in my office) that the champagne corks stick out maybe 1/8", if that much. We love it and have it proudly filled and displayed in our living room. Deep as the corks themselves. We designed it first & then lifted each cork to glue them in. Turned out very nice! It's about 1 5/16" Most of the corks I used are flush (or almost flush) with the edge. how do i give you the info in order to monogram it? BEST ANSWER: The Large Wine Cork Board Kit is not a item that can be personalized. I recommend the Personalized Large Wine Cork Board Kit, item number 340 55 05. How heavy is the frame? How is it hung on the wall? Is there hardware for that? BEST ANSWER: There is a hanging kit and it gets hung similar to like how a picture frame gets hung. Approximately how many corks does one need to fill this board? BEST ANSWER: Thank you for your question. As per the product description it will hold around 256 corks. Thanks! My husband lightly sanded it, painted it black, attached it to the table base, filled it with corks, and topped with glass. Voila - perfect coffee table for informal TV space! I was amazed how easy this project was. I was able to create a pattern and fill 75% of the board in about an hour. It's still a work in progressive because I need additional corks. I didn't not want to buy corks because I prefer to make the board out of corks from wine I enjoyed. I highly recommend separating corks by type and size. A large cookie sheet worked great for me. I highly recommend this project. And old bread knife works great when you have to saw to fit. It's a gift that will be used as a bulletin board. Already have bought 4 of them! Love this cork board! Painted the trim on a couple to match the decor of different rooms . . . one in the kitchen (for all the appointments/invitations etc.) . . . two in the playroom (the kids' art/friends' pictures etc.) Only need to enjoy some more wine to finish the next board! The large wine cork board takes about 306 corks! We thought we had a large number of corks, but since we are short about 8, we will just have to drink more wine! We had fun looking at our corks on a cold Sunday afternoon. Even though we have not yet glued the corks, we can tell that the board will look very nice when finished. Great way to reuse your corks! What a great way to go green - reuse your corks and have a greast bulletin board as well. The wood is beautifully constructed and well-made. It is a great gift idea. These are great bulletin boards for the wine lovers. They make great gifts and it's fun to see all the different winerys. I bought this cork board kit with low expectations and was greatly surprised. It was easy to create and when I hung it on the wall and used it for messages in my kitchen it added style to my kichen. We have been saving corks for years and had just re-done the kitchen. So instead of putting up the old bulletin board we made this cork board. It was fun and easy to do. Took a little time, but is worth it. Use the hot glue gun. Corks set quickly and don't move! We've gotten many compliments! I have made many of these boards. Friends and Relatives always admire them and want one. I was making them with wood glue. I highly recommend using a glue gun. Have been collecting corks for a few years and have finally run across a fun way to display them. Think this board uses about 260... we need to drink a few more bottles, but no problem there! We are planning to add corks to the board as we use them even though it's not quite complete yet. Cheers! Very prompt before the holidays! I collect boxes of corks and make cork wreaths, candle holders, napkin rings, trivets, picture frames, etc. I needed a bulletin board for the office and this was perfect and fun to assemble...very easy. It looks great on the wall and helps organize my life. The wood frame is well made and beautiful. Great product. This is the second one we purchased. This was a gift, and they thought it was great! I am using this in my office as a memory board. Delivery was prompt, it was packaged well and arrived in perfect condition. Came quicker than expected, excellent condition. Great way to show off your corks! I have this on a wall near my wine chiller. It is great for display on it's own and functional as I can pin up menus, schedules and other items. Enjoyed making this! I had 3 other households saving corks for me as well as my own! The number of corks that it says it needs is accurate. As the instructions say, I had to trim several corks to make them all fit snugly and hot gluing them on was no problem. It is a very solidly built frame. You have to attach the hanging hardware onto the frame, but not a problem with an electric screw driver. I have no complaints at all about it and I'm saving more corks for the other projects available! Now comes the enjoyable part, drinking the wine to collect the corks. I got this for my husband for Christmas. We have been working on it together and remembering all the wines we drank! I initially bought this board to place seating assignments for my daughter's wedding, she used it in her kitchen after the wedding to post appointments, coupons and items that she needed in sight to remember events, etc. I bought two more, one for my son's kitchen and the smaller one for mine. We have all received compliments on these boards and they quickly fill up with printed material you need close at hand. Initially I thought I could only use real corks, but the rubberized corks also work, it does take a bit of patience with a glue gun, a cheap glue gun works just fine. Two years later and this board holds up to many postings. I filled this in with corks I had and gave it as a gift - my friends just loved it as they know that they helped drink a lot of the wine the corks came from!! Great Gift for anyone!! Sorting through old wine corks brought back some great memories of lovely wines and gave us a challenge to fit them all into the board. The end result is a great place to pin important, interesting or sometimes just fun items. Have seen these for sale as completed projects, but love the idea of using my own collection of corks collected over the years. Much more meaningful that way! this can be a great conversation piece. It looks really good on the ottoman in my livingroom and is waterproof with the cork. great craft project and would also be perfect for as a gift. I have the corkboard hanging in my kitchen for use as a bulletin board. Have beem asked many times where I purchased it and when I say I assembled it myself,everyone is impressed. Much easier than the oval trivet. Stick with square designs for easy cork placement. Looks great when done - people love to look at all the different corks. Great recycling idea. This is a great idea, but no where in the description does it say that it needs about 250 wine corks to fill the thing. 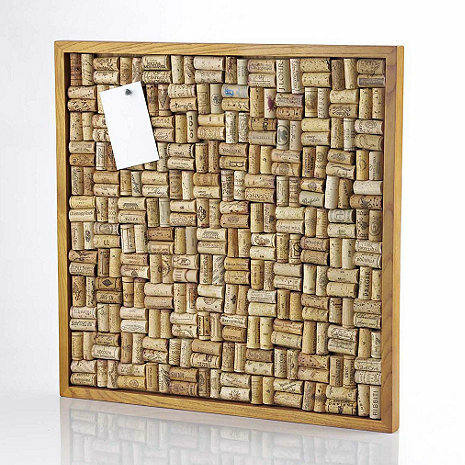 WineEnthusiast wine corks are too expensive for the amount that you need to purchase to fill the board. Also, note not to use Gorilla Glue to glue in the corks. It expands and looks terrible. Use a hot glue gun. It is much much better. I had bought a similar kit a few years ago. This one seemed to have been cheaper. For instance, there was no kit included to hang the bulletin board. Also last time they included glue, but the glue wasn't all that great, so we used our own glue instead. That change wasn't missed. Really Nice,But buy on sale,Too pricey for what you get.But if youd try to make it on your own,it probably would not look as nice. Hangs great in my bar. I use this product as a cork board, it looks great in my kitchen. The board is the envy of all my friends!